Mayor Rahm Emanuel lashed out at President Donald Trump's plan to eliminate federal funding for new transit projects. 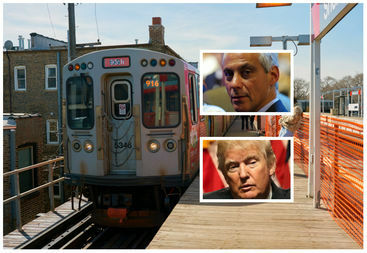 CHICAGO — Mayor Rahm Emanuel is urging an increase in the federal gasoline tax to help pay for mass transit, while also taking a swipe at President Donald Trump. In a New York Times op-ed published Monday, Emanuel touts the CTA's operations and investments but makes a pitch that Chicago, "like every municipal transit authority, needs federal support." "Rather than tweeting about violence in Chicago, President Trump should be looking to Chicago as a model for the infrastructure investments and economic growth he wants to replicate across the country," Emanuel said. "Instead of embarking on his wrongheaded plan to privatize infrastructure construction, [Trump] should expand existing programs that have used local-federal partnerships to build transportation systems," he added. Among the funding schemes, Washington should increase the portion of the Highway Trust Fund that supports mass transit to 25 percent, while also raising the gas tax by 10 cents, Emanuel writes. "Yes, Americans would pay more at the pump, but it is a smarter alternative than the Trump administration's privatization plan, under which we will all pay more in tolls and fees to the private investors who would own our roads and bridges," he said. The Trump administration has indicated it plans to introduce $200 billion worth of tax cuts during nine years that officials said would help spur $1 trillion in new spending on roads, bridges and other construction during the next decade. The administration wants to also significantly speed up the approval process for projects. In addition, the proposal could provide benefits to local governments to sell their existing infrastructure to private firms. The Trump administration's federal budget proposal would eliminate federal funds for new transit projects, officials said. Emanuel used the high-profile opinion piece to give himself a bit of a pat on the back. Noting recent mass transit problems in New York and Washington, Emanuel says that because in Chicago the mayor controls the local transit agency — unlike in New York City and D.C. — it runs more efficiently. "While there is no one-size-fits-all model, I am confident local control is essential to Chicago's transit success. It strengthens accountability, focuses priorities and ensures the people most directly affected by decisions have more of a voice in making those tough decisions," Emanuel said.